The "Fist of the North Star" movie (a.k.a. 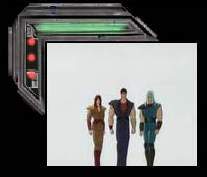 "Hokuto no Ken") was released in 1986. There is also a series that came out in ’84. "Fist of the North Star" is set in the post Apocalyptic, "Mad Max" like world of the future; and to prove it, Ken wears the Road Warrior’s leather jacket. 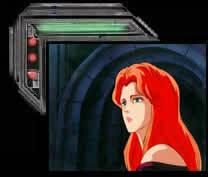 "Fist of the North Star" starts with Julia (Ken’s true love) being taken by Shin (Ken’s friend, now insane enemy). In the process Ken is murdered. But Ken’s tough, so he somehow resurrects himself, and decides to go and get Julia back. On the way to Shin’s fortress, he fights one of his old school mates, Jagi; and makes friends with 2 children, Bat and Lin; and a man whose hands can work like a Cuisinart, Rei. When he reaches Shin’s fortress, Shin is dead and Ken’s other schoolmate, Raoh, has kidnapped Julia. Raoh and Ken have a duel. Julia dies in the process, but instead of just dying, her soul becomes one with mother nature and she lives on in the patches of flowers on earth. I’m not sure if Ken was supposed to have died after his fight with Shin, or if he was just injured. When Ken first reappears he’s incased in a dirt shell, and I don’t understand why. This has to mean something, why else would the creators of this cartoon decide to animate him this way? Many fans consider "Fist of the North Star" to be one of, if not the, most gory anime ever made. Ken has a 1000 hit exploding body technique. The gore, which is beyond ridiculous, combined with Carl Macek’s dubbing, make this cartoon a very gory comedy, with some truly sadistic moments. FOTNS is not for everyone, but it’s not an “Adult/Not for Kids” cartoon. If I said it was, I’d be lying. FOTNS is made for young men between the ages of 15 and maybe 25. Anyone younger would have nightmares, and anyone older (or female) would probably call it stupid. If you are the target audience (you know, you consider Tarantino a genius, or you consider Samurai films to be an art form) you’ll find many enjoyable scenes.